Although many of our journals are electronic nowadays, you may still find yourself needing a printed journal. These are some of our print journals in African Languages and Literatures. 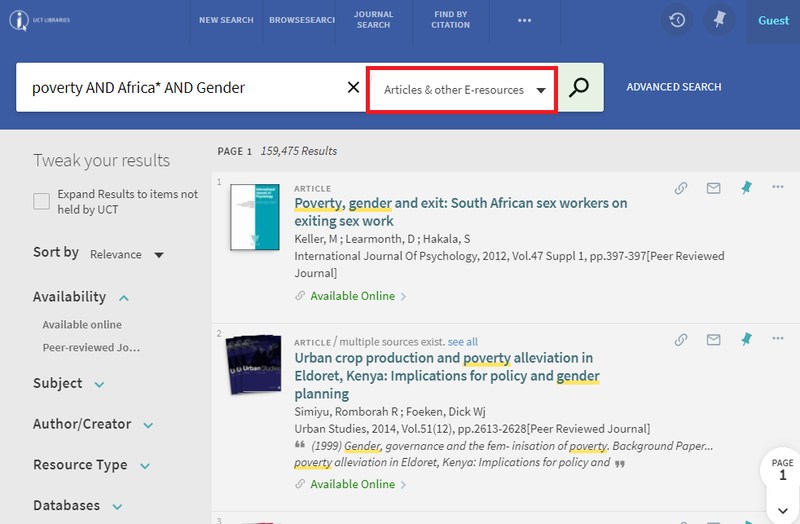 PRIMO is a tool for searching across the UCT library book catalogue as well as a selection of our databases of full text journal articles, all with one query. 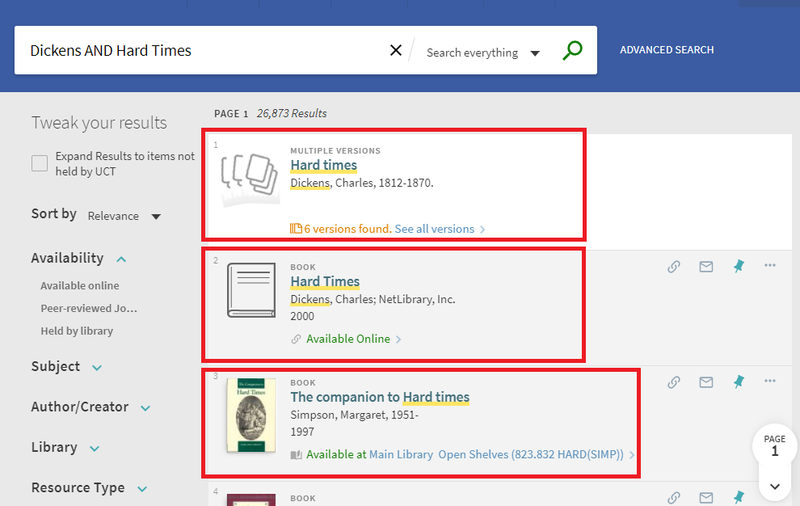 This quick and dirty search brings up the print and online copies that we have of Hard Times, as well as books about Hard Times. The shelf number works like a street address – just follow the numbers up or down until you get to the address you want. Shelf numbers keep related books together, so once you have found your book, it is often useful to browse the books on either side of it as well. 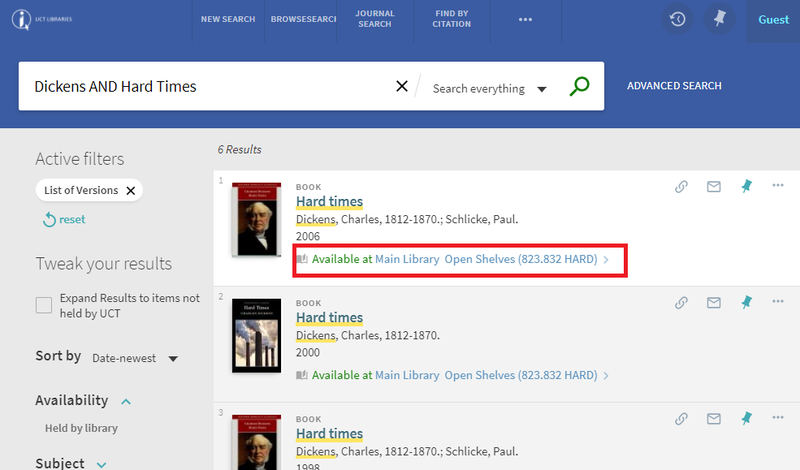 In fact, you don’t even have to physically be in the library to do it… If you again click on the title of one of the results, you will be taken to the full record for the book – which has a virtual browse option – so you can see all its neighbouring books…. You never know what you will discover that way. 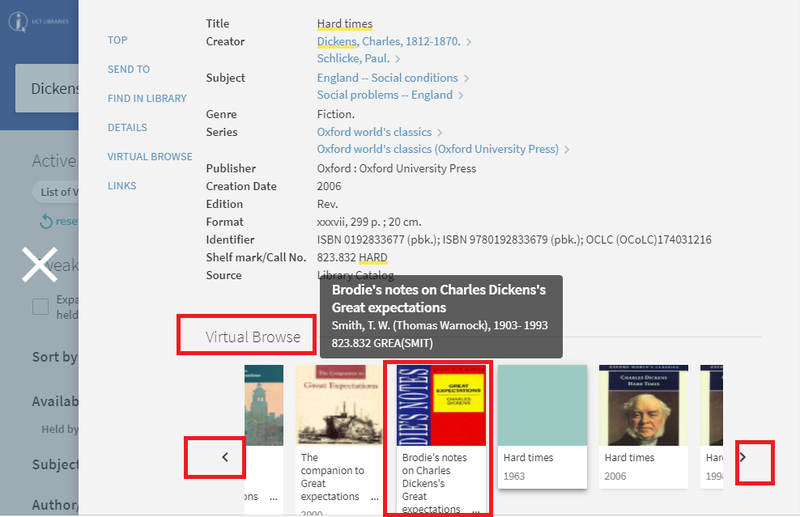 On the search screen you can use a drop-down arrow to search only for electronic journal articles or electronic books or reference works. 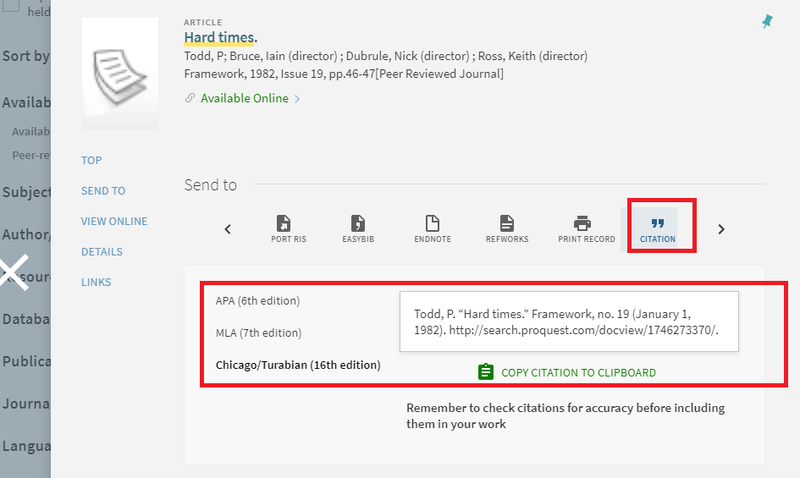 Or, even better, it allows me to send the record to a program like RefWorks or Endnote, which does my citing for me, automatically, at the touch of a button…. Shaffer, P., 1998. 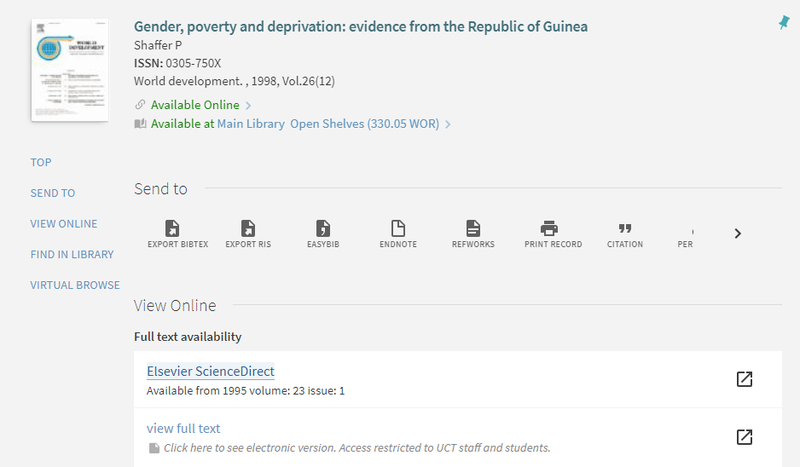 Gender, poverty and deprivation: evidence from the Republic of Guinea. World Development, 26(12), pp.2119-2135. 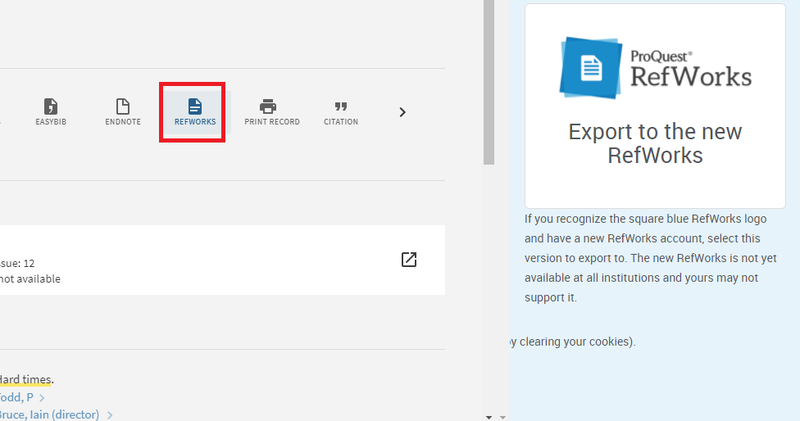 And clicking on the full text or database link will take you to it. 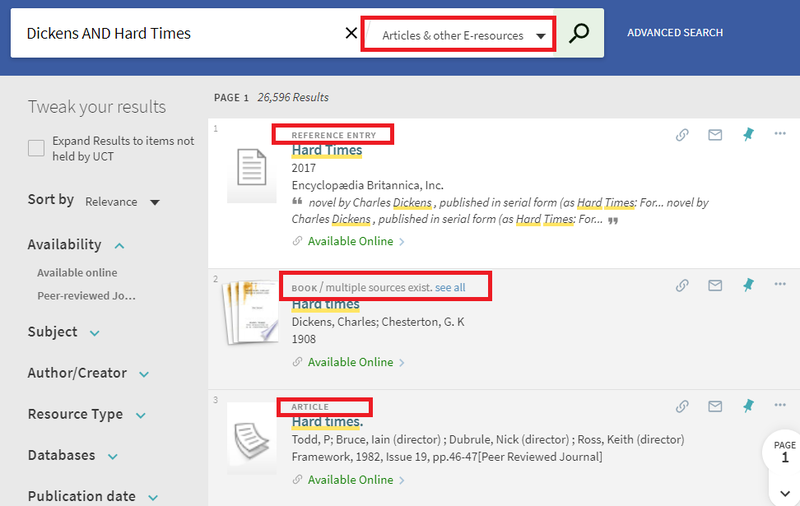 It is possible to create very precise searches just using keywords. The trick is to combine them with Boolean Operators, wildcards and brackets. Most of our databases, including our library catalogue, take Boolean operators. 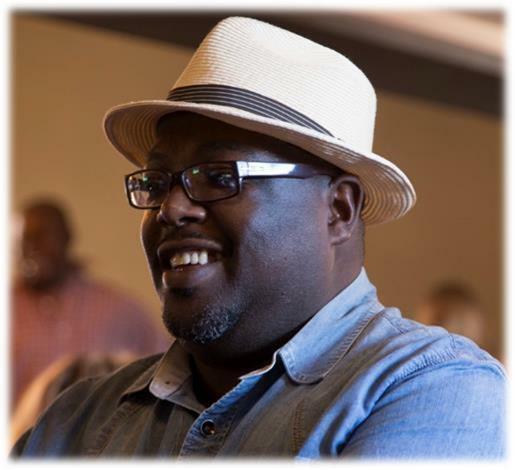 The OR expands you options – women or gender must come up in the results, it doesn’t matter which…. The (brackets) keep the OR words together and relate them to the AND which follows – otherwise the search would call up anything to do with women, regardless of whether it had to do with poverty and Africa…. Any words linked with AND must be included in the search results - OR broadens a search, AND tightens it. NOT excludes a term. Be careful of this. First search without it, to get an idea of what you are missing. “Inverted commas” enclose a precise phrase. To use Boolean operators (AND, OR, NOT) in PRIMO, you must enter them in CAPITAL LETTERS, otherwise PRIMO ignores them. 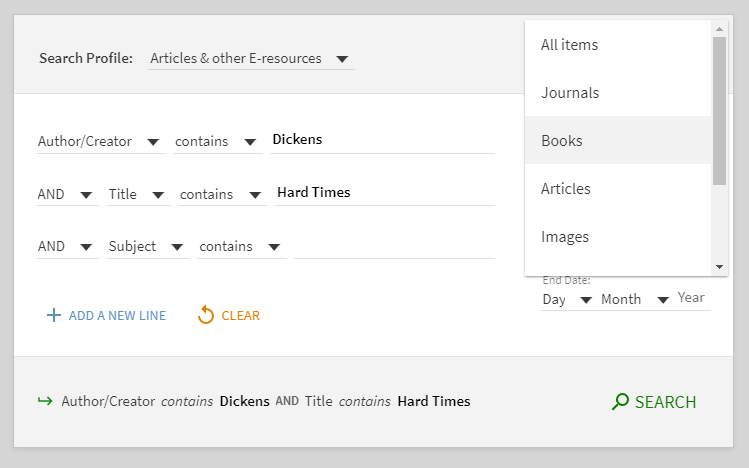 You can restrict the search to electronic journal articles or electronic books only, using the drop down arrow – useful if you are off-campus. The African Literature books (Poetry and Novels) are located on Level 3 of the Chancellor Oppenheimer Library, down a spiral staircase near the Information Desk. They begin with the shelf numbers 896. These books may be borrowed. The African Language books (Linguistics, Teaching and Learning) are located on level 5, at the North end of the Library. They begin with shelf number 496. These books may be borrowed. Our books are given shelf numbers according to the Dewey Decimal System - these shelf numbers keep related books together by subject. You can follow the numbers like a street address to find a family of related books all together on the shelf. At the end of each shelf number there are a few letters, for example, 896.398532 NGEW. These are the first letters of the author's name, and keep books by that author together on the shelf. There is a list of the main shelf numbers for African languages and Literatures in the left-hand column. Some copies - typically rare, irreplaceable or fragile works, or copies that are being kept as a legacy for future generations - are kept in the African Studies collection in the Special Collections wing. Their shelf numbers begin with the letters BA. These books may be read in the Special Collections Reading Room, but may not be borrowed. Journals are published every few weeks or months. They are academic magazines that contain articles on different topics. Journals are important for finding very up-to-date information, or very specific information on narrow topics. 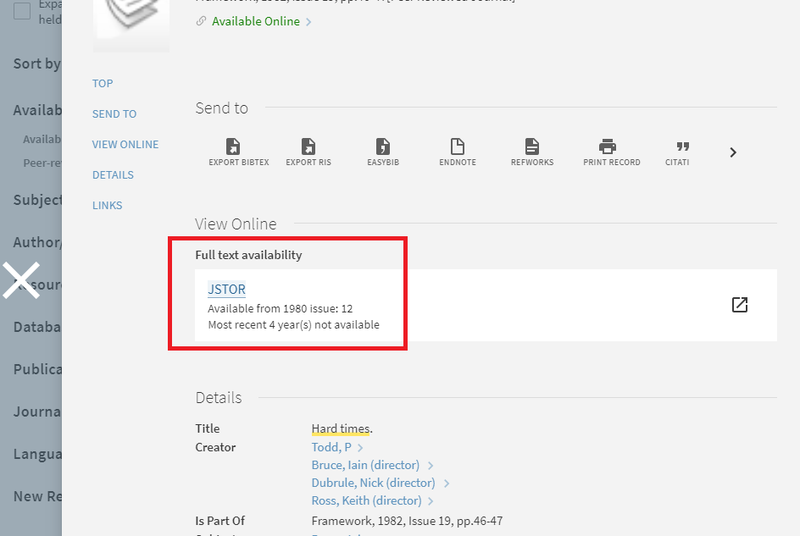 The great thing about journals nowadays is that so many of them are available electronically as well as in print, although that is not always the case in this field. The latest unbound journals are kept on level 5. The bound copies since 1965 are located in the basement. Pre-1965 journals are kept in an off-campus store and can be requested from the Loans Desk. 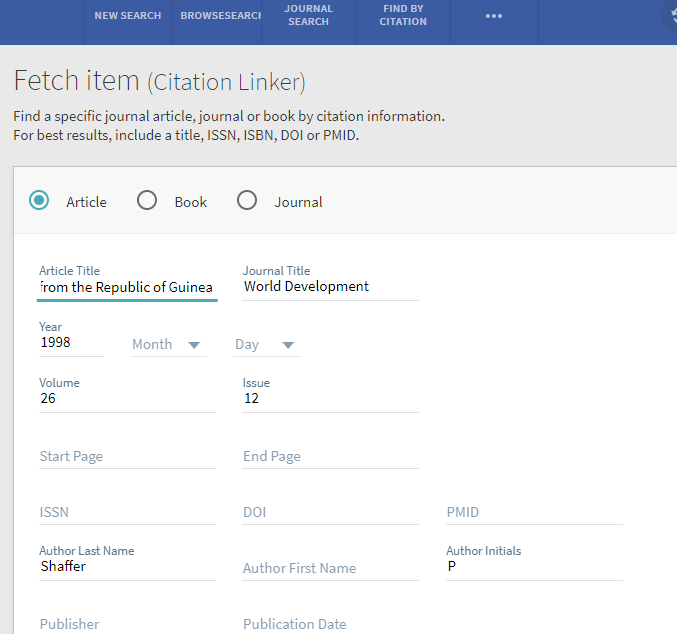 Many of our journals can also be found full text in electronic format on our databases. 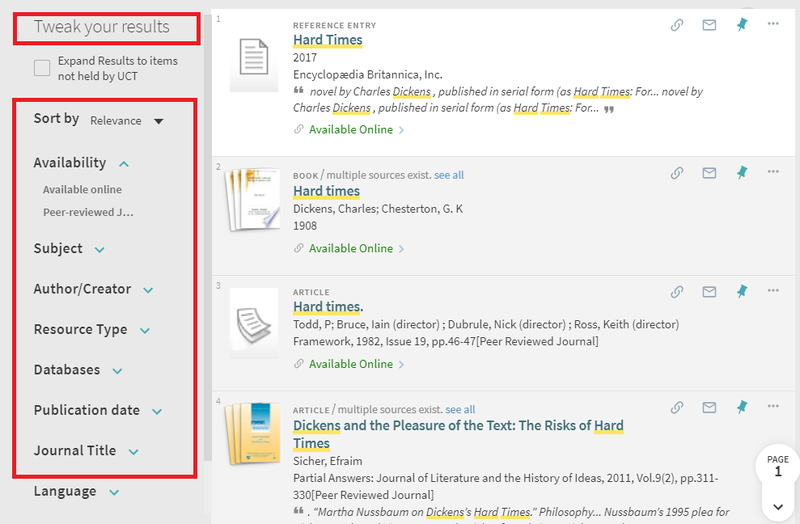 These databases contain thousands of journals, all searchable by keywords, like chunk of Google. Most of the journals are full text nowadays. In some cases, though, the databases may just give a reference to the journal article, rather than the whole thing. This will tell you which year and volume and pages of a particular print journal to look at to find the article. 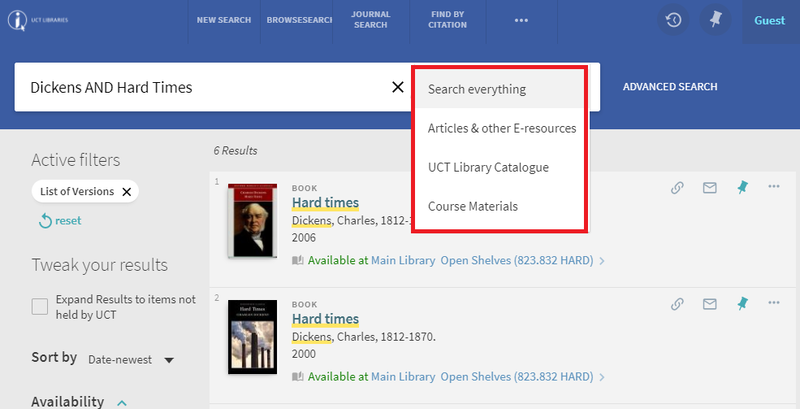 You can get to our databases from www.lib.uct.ac.za and mousing over Search & Find and selecting Databases. 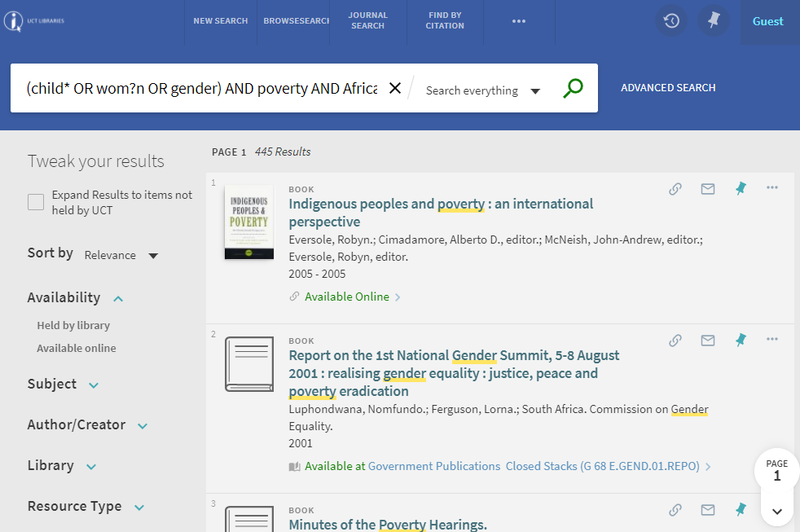 The main database of specific interest to African Languages and Literatures is Africa-Wide Information- via EBSCOhost.